I was just realizing that out of all of my many hobbies I only really do one thing at a time. I like to read, sew, take pictures, paint, draw, crochet, and knit among other things. I recently went through a reading spurt and read several books and now I don’t feel like reading anymore. 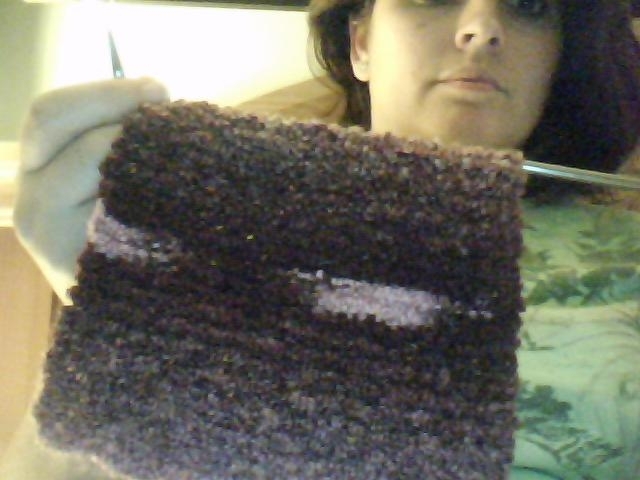 My newest thing is knitting. I am a beginning knitter so I’m making a scarf for a co-worker. It’s great for de-stressing after a long hard day. I love to knit in the bathtub. There is nothing better than soaking in a nice hot bath with a bath bomb while listing to tunes and sipping a coffee with baileys. Mmmmmmmmmmmmm. This laptop my husband bought me has a little webcam in it. Here is what I’m knitting. I have a looooooOOOOOOooooooong way to go!